When the city flooded in autumn 2000 I realised the severity of it from TV reports and the local paper. When the city flooded in autumn 2012 I realised the severity of it from a photo posted on Twitter at 9.27am on 25 September. We have a new river since 2000, an endless stream of information. In 2004, Facebook arrived. In 2006, Twitter. In 2007 Apple released the first iPhone. Then there are people like me with websites and blogs. The drama of the flooding Ouse created in turn another flood – of comment and images via the web. A lot of information to wade through, an occasionally wonderful but often wonky world. Photos taken hurriedly on smartphones giving the impression that not only was York flooded, but it was weirdly tilted and perhaps sliding off the planet altogether. I observed via Twitter the rising concern, as local businesses and Visit York tried to clarify that most of York city centre was normal and not underwater. My own website search stats showed that people were looking for information on particular buildings or streets. One asked ‘Is Micklegate flooded’. Looks funny to York folk, but not surprised they were anxious and asking. 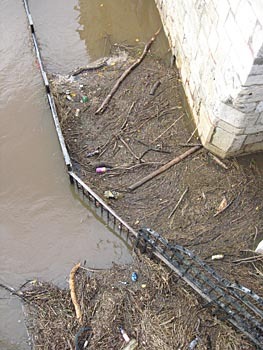 Twitter, Facebook, every photo sharing site was filled with this flood of information about the #yorkfloods. It all looked dramatic, and, like the river, it didn’t always respect boundaries. It’s rather disconcerting when complete strangers point a camera at you, when you’re going about your business, an ordinary person. We tend to forget this. Taking photos and putting them on the web may be a modern phenomenon, but other aspects of the viewing of this flood are deeply traditional. Gawping at other people’s misfortune – we’ve always done that. A couple of days ago I was in town and thought I’d see whether the flood levels were dropping, by Lendal Bridge, before I headed up Coney Street. At the end of the bridge, by Lendal Tower, a line of people looking over, down to the slope leading to the tower and the house alongside it. I was curious too, and looked down, as two men struggled through the floodwater with a large rectangular object. Their TV. They had a load of stinking river in their house, and they were having to deal with this while an audience watched. One of the men carrying the TV looked up momentarily. I wasn’t taking photos, so I saw properly his face, and his expression, as he waded through the brown water. I felt ashamed for looking, for being a passing spectator, someone who won’t be there taking up the carpets and dealing with the stink. He looked tired and resigned and also a bit troubled by our gawping down at him. So I moved away and stood on the bridge a little further along. Instead I took the rather less dramatic image above, of the debris caught in railings near that house. Twigs and other natural things making a rather pleasing pattern, studded with the ugly trash of cans and bottles thrown in the river. The flood of tweets and uploaded images has subsided, and we’re waiting for the grubby floodwater to do the same, though as can be seen from the photo above, anyone who had this in their house has a lot of cleaning up to do. Whether Twitter and the like will be full of pictures of the rubbish, mud and sewage left behind remains to be seen. Also from the Press, 4 November 2000: York inches from disaster. Only phone numbers offered back then, for people in at risk areas needing flood news. One of the most memorable images of the impact of the floods, one I’ll remember anyway, wasn’t a photo at all. It was a woman on BBC Radio York talking about her experience downriver at Acaster Selby, dealing with a flooded house, stranded livestock, having to send her children to stay with relatives. @BBCYork are on Twitter too, and Facebook, but through allowing people to speak at moments of crisis they bring us a vivid picture, in that particular way only they can. Good old #localradio @BBCYork, as we might say on Twitter. Oh how I hated Hockey. I had so many bruised ankles from getting hit with the hockey stick. Loved Danish rounders in the school yard, plus skipping games with the long rope with a girl at each end, everyone jumping in and out to varying rhymes. Ball games against a wall too were very popular, sets of four different throws and you were out when the ball dropped, you added claps and clap roll etc. until finally down went the ball and the next girl moved in to your place. Marbles with glass marbles, a small hole scooped into the soil and sending the marble off with your crooked finger. It was awful if you lost them all as I frequently did. Hopscotch was ever a favourite and many a set of six squares was hopped over with a piece of flat stone or slate till you stepped on the line and were out!!! We had no money but we had fun. My Saturday penny pocket money took me ages to spend in Mr Peckitts sweet shop,. We must have driven the poor man mad with our dithering over his display of open cartons of individual sweets, from dolly mixture to jelly babies. sticks of spanish and the round roll with the little centre sweet. Aniseed balls etc. My dad would appear home with a box of waste (sweets that had been on display too long) he got them cheaply and it was such a treat to have expensive Rowntree or Terrys chocolates or sticky boiled sweets etc. Interesting to read you ‘girls’ having a chat,Mill Mount,versus Queen Anne,and to see the viewpoint of one from the 1930/40’s,age group,contrasting with two from the 1960/70 era,but all of you”Hating Hockey”! !What a difference two decades make,with the earlier,at war,trying to survive on nothing,and the latter at peace,enjoying the fruits of their predecessors hardships. That Peckitts sweet shop rings a bell in my memory,wonder if it was the shop opposite my Grandad’s chemist shop(Douglas Hardie)in Micklegate,just near to Raimes’ wholesale chemist’s,where I lived for some time in the late 30’s.